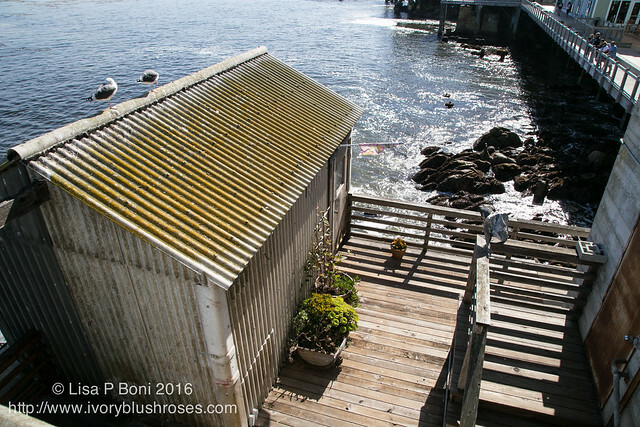 On the third day of my California journey, my friend once again picked me up in the morning and this time we drove south to Monterey where we visited the Aquarium! Years ago, my Mom and Dad had visited and came back raving about it, so I was really looking forward to it! 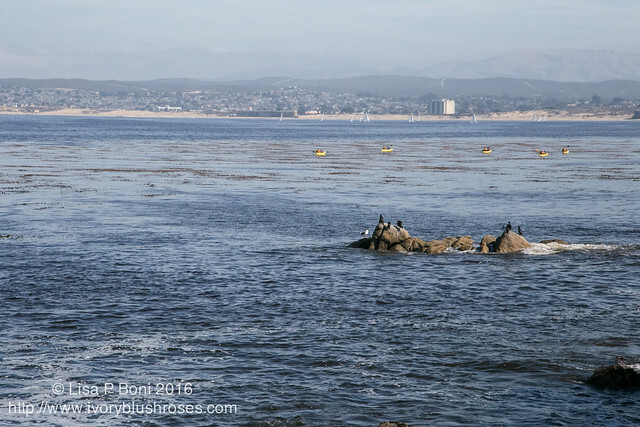 The views outside the aquarium, looking across the immense Monterey Bay was lovely, with waves breaking over the rocks and watching the birds walking on top of the kelp as it drifted along the surface of the water far from its roots far below the water. Just a hint of the incredible world that exists below water. 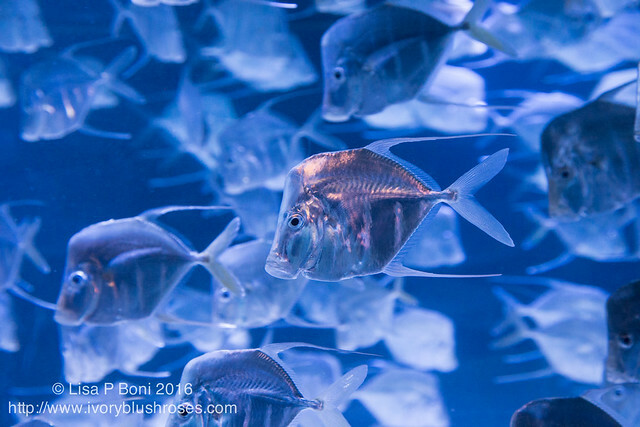 Inside the aquarium, the enormous bounty of the sea was made visible through windows into the huge tanks that pump water from the sea on a daily basis. These fish, looked almost like they were pressed out of aluminum foil to me. But they represent a species that lives in that middle zone between the shallow levels of the sea and the deep sea. Fascinating! 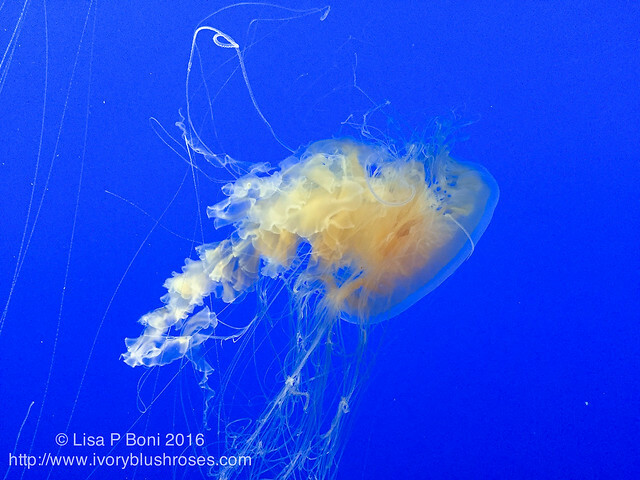 I also loved the numerous displays of jelly fish! How interesting to discover that what I thought was their right-side-up position was actually upside down! In intriguing to see the wondrous variety and once again to be reminded of the enormous creativity of our creator God. 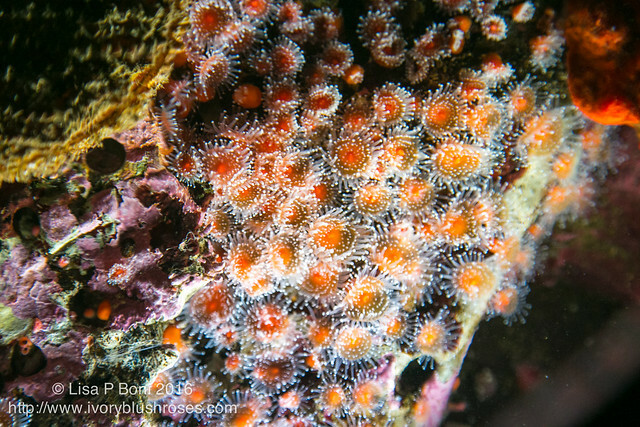 The seeming plant life of the sea so often turns out to a living creature as exhibited by these small anemones. One of the big features of the aquarium is their multi stories tall tank featuring the habitat of the kelp beds. 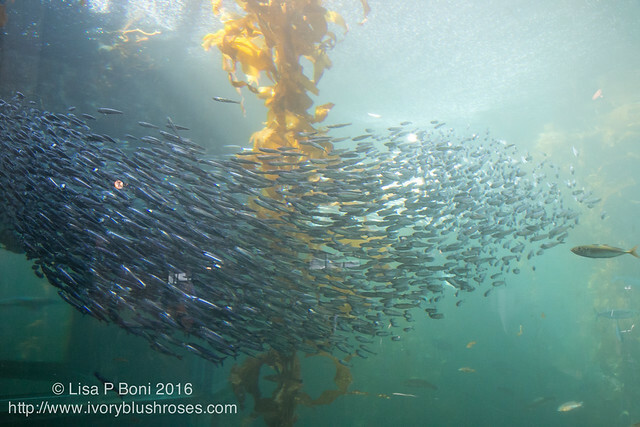 I was fascinated by the schools of anchovies that swam in endless circles around the kelp, their silver sides a constant glittering wheel in the sea. Suddenly, I have a new appreciation for my sister's love of scuba diving! Truly, under the sea is a completely different world, vastly different from the world above water. Captivating! 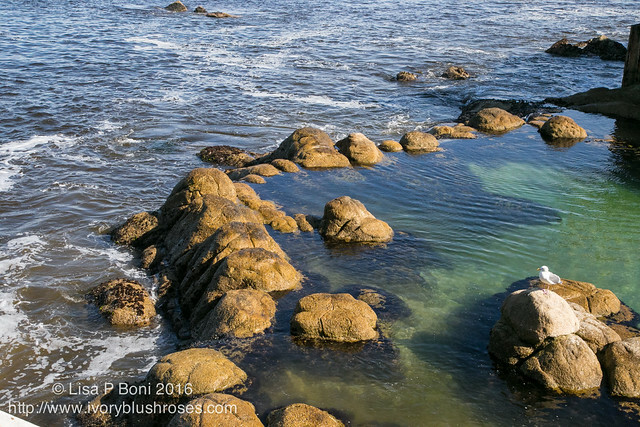 So amazing to stand, looking down upon tidal pools and deeper waters and consider what lies beneath! 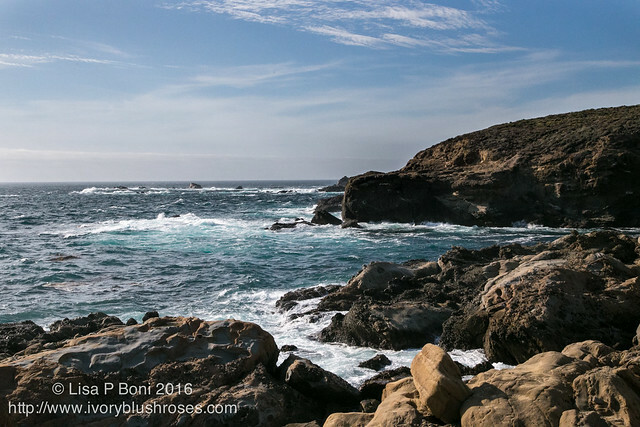 After leaving the aquarium, we drove south to Point Lobos. 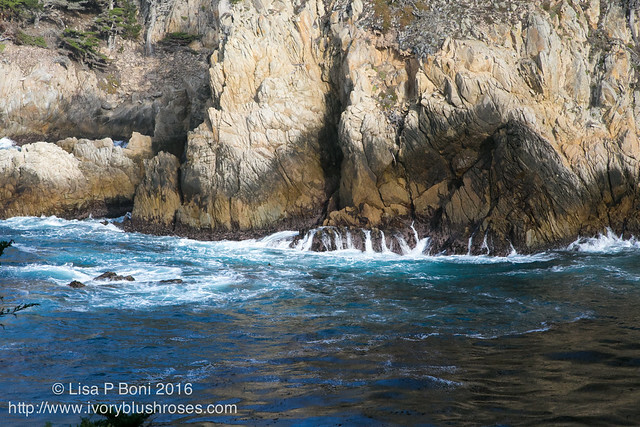 It wasn't until we got there that I realized I already "knew" Point Lobos. Though I'd never been there, I had seen numerous paintings of the area through my plein air painting friends and artists that I follow online! What struck me immediately was the color of the water ~ that deep aqua that fades into the deepest prussian blue. Against the black and golden rocks, it is truly spectacular! 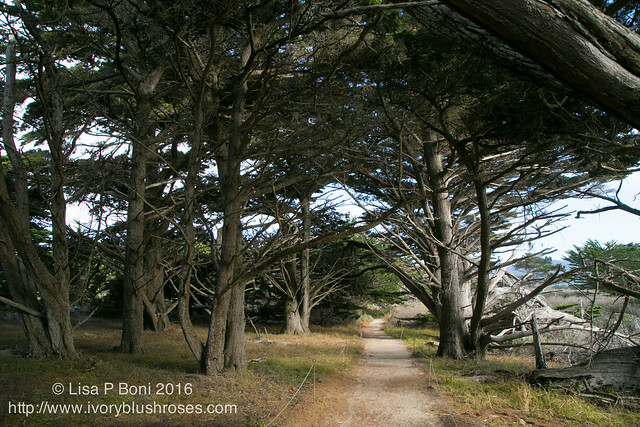 Our walk led underneath the canopy of a grove of Monterey Cypress trees. Here and there the trail came out to views of surf on the rocks below, that beautiful aqua appearing with each surge of waves across the rocks. Around other turns were glimpses of flora unlike any I had seen before. 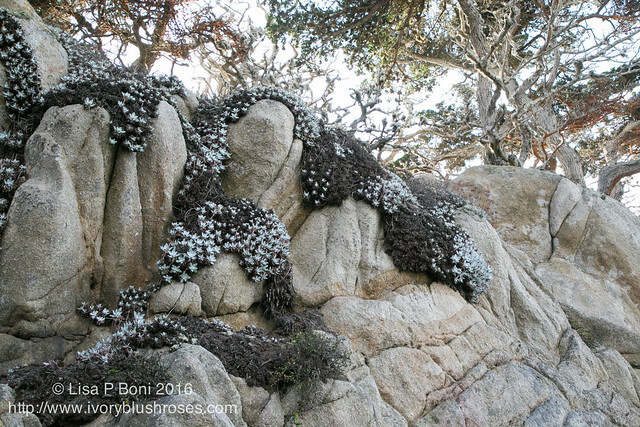 What appears as white flowers here is actually the pale green leaves of a succulent that cascades over the rocks. With the slivery light of evening sun on the trees above, it was a magical sight! 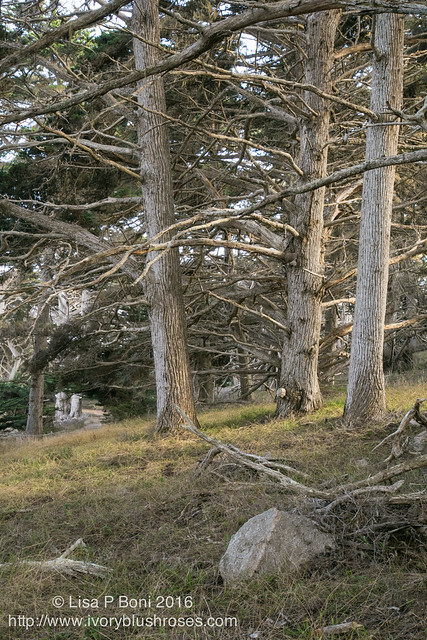 That evening sun also poured across the grassy hillside under the trees and it was here that we came across a small herd of Coastal Mule Deer, so much smaller than the ones here in Colorado! Each view of the shore was another view of amazing blue water. No wonder this area has featured in so many paintings! I felt like there was another painting at every turn! As I often find, there is beauty in the small things too. 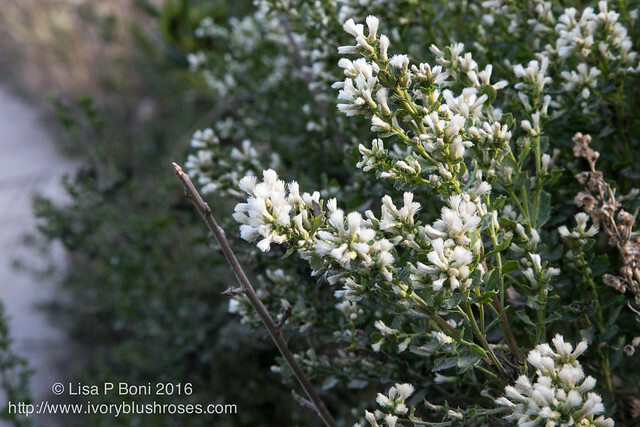 These white fuzzy blooms about to burst forth into a cloudy confection catching the evening light were lovely. We took another path to see this magnificent tree known as the Old Veteran. 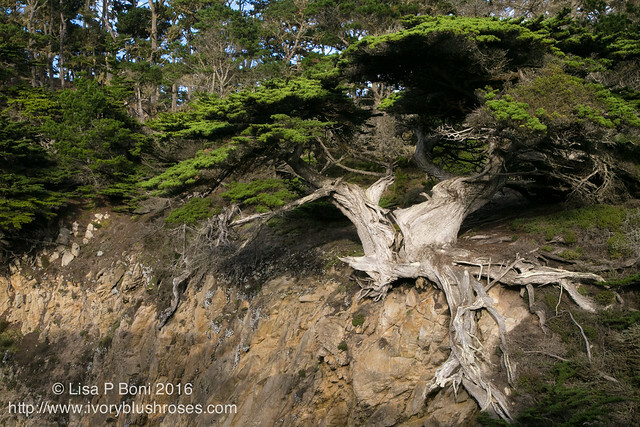 What a massive tangle of roots that is cascading across the cliffside and anchoring it in place! The photo doesn't do justice the magnificent or grandeur of this massive old tree. 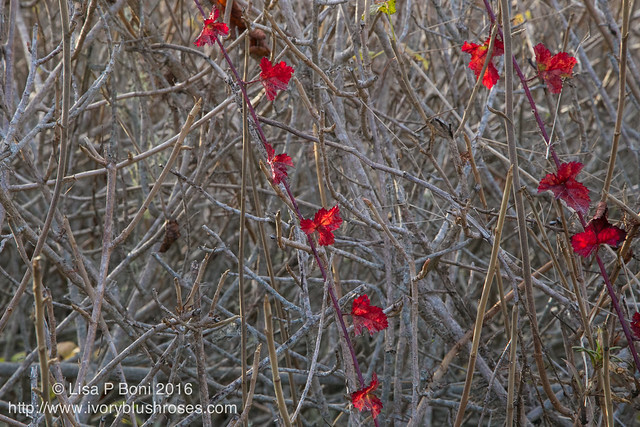 In a tangle of now leafless shrubbery, vines of scarlet leaves acted as a seasonal garland. We were cautious not to touch anything with leaves of three as this area is full of poison oak and I for one, had not ever encountered it before and unsure of it's true identification! The area was full of scarlet leaved plants that could all have been poison oak from the brief descriptions we saw on signs at the trailhead! Thankfully, we managed to stay free and clear and rash free! One cannot help but be awed to see a place such as this. 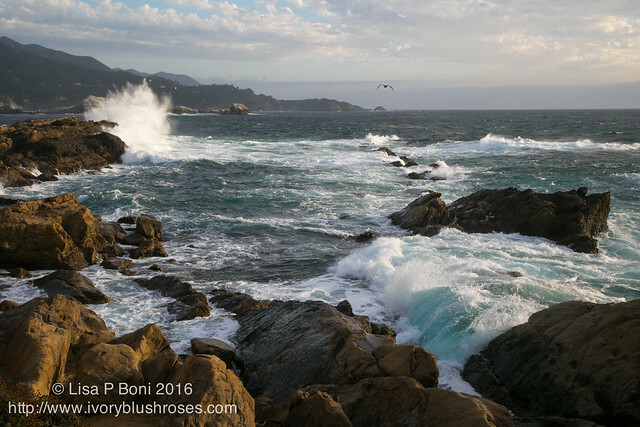 It brings home the power of the ocean when waves crash against rocks and water goes flying 20, 30, and maybe even 40 feet in the air! 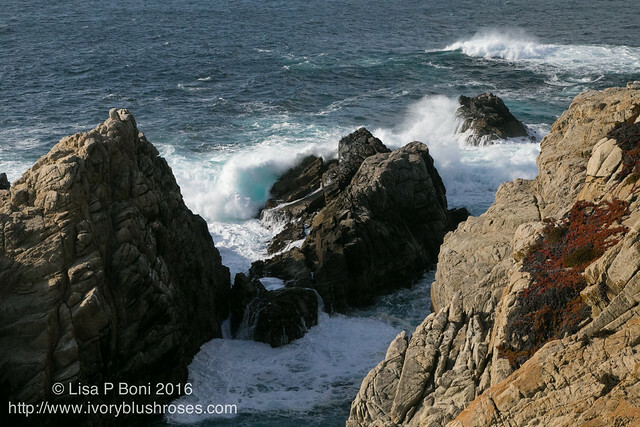 The surges of water over rocks and the sound of surf pounding the shore is amazing. To have seen it in action on both coasts of our nation this year has been a gift and these glimpses of the sea will live long in my memory! I'm so grateful to my friend who knew that I would rather see these wonders and orchestrated 2 1/2 enchanting days among gardens and nature rather than taking me to see the more "traditional" sites of the area. It was amazing! Then it was time for the lecture and workshop with the Santa Clara Quilter's Association! What fun to see my work displayed all together! 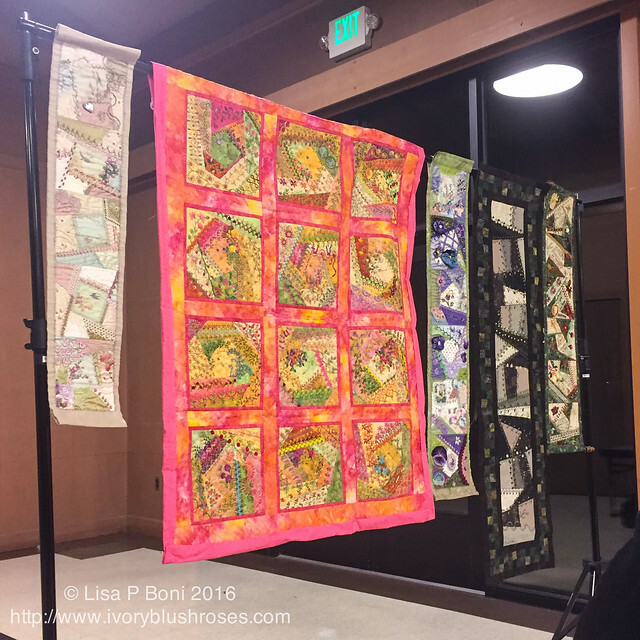 Both events went so well and it was such a joy to meet so many lovely people and share my love of crazy quilting with them! We had a fun workshop and everyone had a great time and made great progress on their Altoid Tin projects! 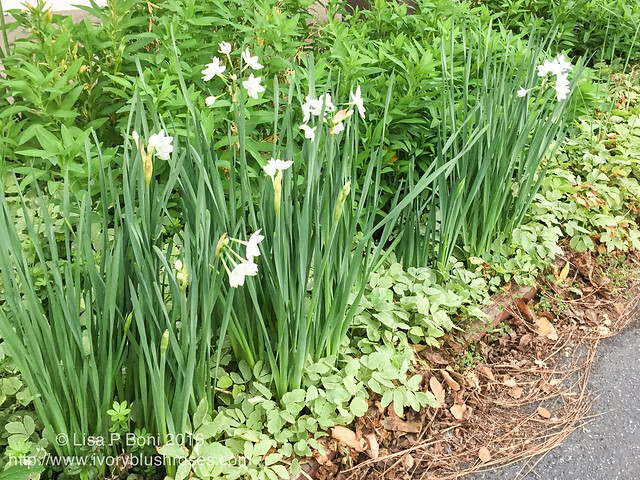 I loved seeing paperwhite narcissus blooming outside! Especially since I can only grow them inside in pots! After I arrived home, it was straight back to work and finishing up my last week of orientation at the new job! 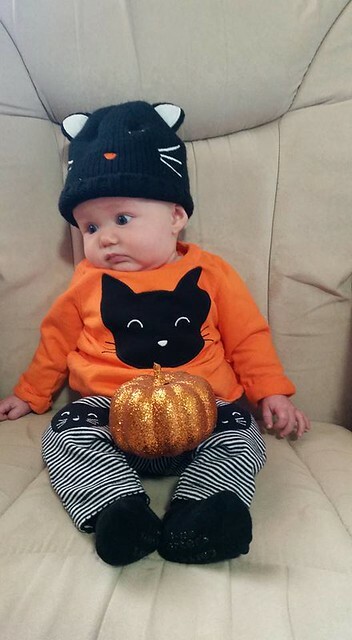 Then a couple of days off and time to carve my annual kitty pumpkin, which is always a big hit with the local kids who come trick or treating! 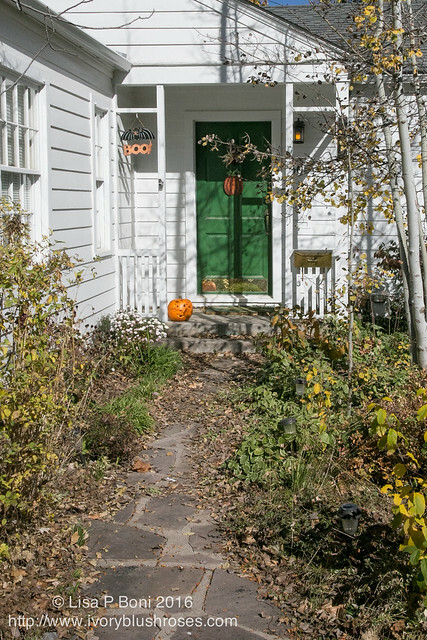 There were less than half of the usual trick-or-treaters this year and I wonder if its the craziness going on the the world these days or if it was due to being a school night. Regardless, there were still lots and lots of kids who rang the doorbell! 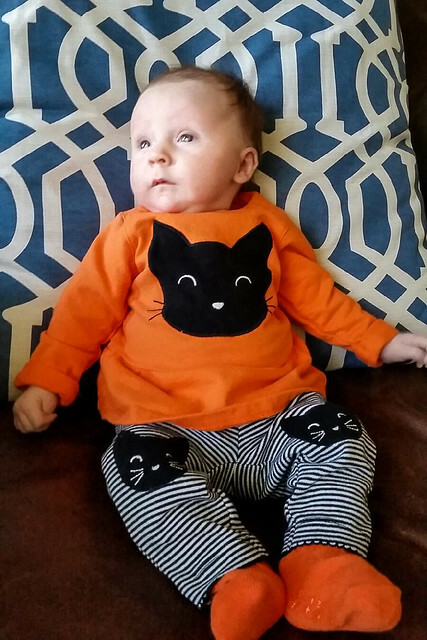 What fun to see my two granddaughter's dressed in the matching Halloween outfits that I had gotten for them! Though Vivian is younger by 6 weeks, she is a little bigger! Eleanor is older, but a little smaller! Both so cute! Wish we could have coordinated a visit to take photos of them together, but we couldn't make it happen. What a blessing these two cuties are! Makes my heart so very full and glad! P.S. I meant to space my posts a day or two apart but inadvertently posted them both, so be sure to read the previous post too! Monterey is a fun place:). Did you get to eat at bubba bumps? Yum. Haven't been down there for several years. What fun. What a great post! I love the ocean blues and that Old Veteran tree. WOW! Thank you for sharing all of that beauty with us here. Your little grand-daughters are cutie pies! I would love to have gone to that workshop on covering Altoid tins. Sigh! I'm glad you had such a good trip. We enjoyed your lecture and workshop. I finished my tin the following day and posted it on my blog. Thanks so much for sharing your fabulous work, Lisa. Lisa, your photos are wonderful; it appears you had a perfectly lovely time.